Halachic Responsum by the Rebbe Rabbi Yechezkel Lifshitz Halberstam of Stropkow, regarding the question whether enamel utensils can be rendered kosher by heating, like iron utensils. The responsum was sent to Zvi Meir Foigel, Jerusalem 1964. 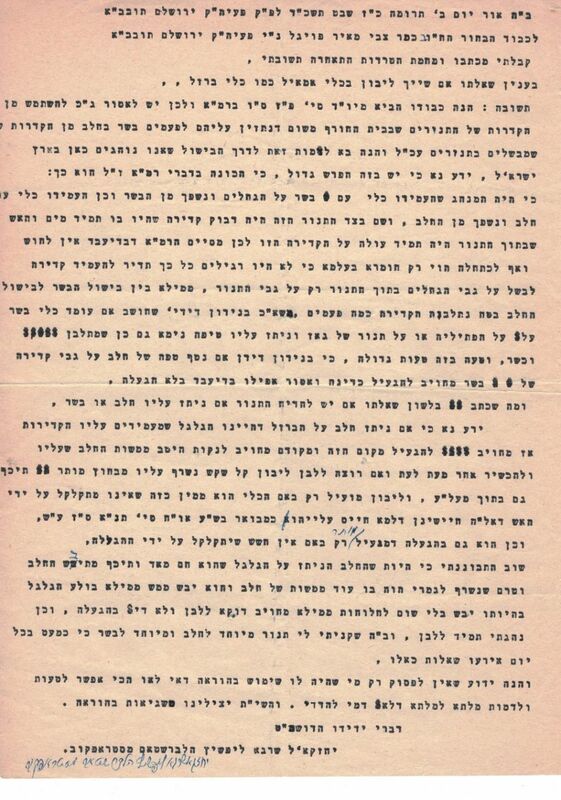 The responsum is typewritten, with the Rebbe's handwritten signature and a correction by him. The third Rebbe of Stropkov, Rabbi Yechezkel Shraga Lifshitz Halberstam was one of the most prominent Rebbes of Jerusalem, and the founder of the Stropkov Hassidim in the Land of Israel. Author of the Divrei Yechezkel Shraga Responsa.